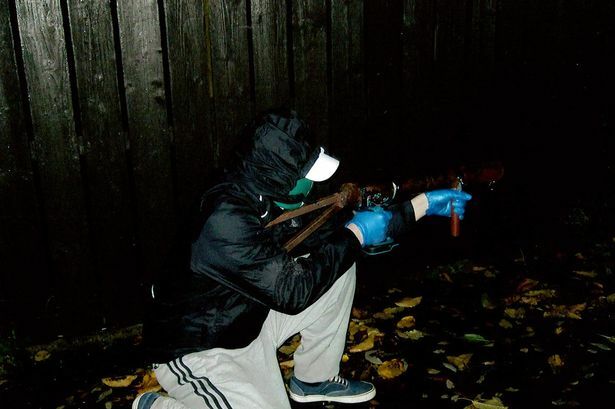 A self-proclaimed ‘IRA group’ reported to be a merger of various splinter groups including the Real Irish Republican Army (RIRA), has released pictures of the improvised grenade launcher used in an attack on an armoured Police Service of Northern Ireland (PSNI) vehicle in North Belfast last week. The launcher appears to be quite crude and the trigger unit seems to be a Makita electric impact driver which has been secured inside a steel tube with electrical tape. The device was reportedly fired from a range of around 60 ft, accurately striking its target and detonating the improvised munition. It remains unclear precisely how the launcher itself operates. Perhaps an improvised mortar round is carefully pushed down the launching tube and fired when the drill’s trigger is pulled on impact mode, acting as a rudimentary firing pin against a shotgun shell primer. Alternatively, the drill may be rewired to an igniter used to set off a propellant charge, as is typical of signature launchers used by the IRA in the past. The device in question was discarded after use with sources confirming it was designed to be quickly assembled “within a couple of hours” and disposed of once fired. 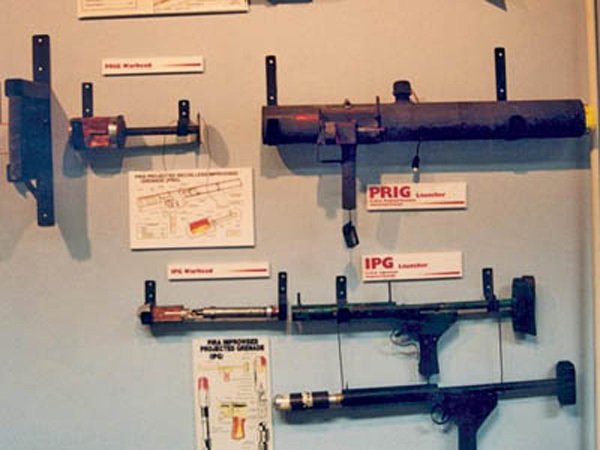 The Provisional IRA of the 1980s and 90s pioneered the design and construction a number of effective improvised launchers, including the Mark-16 PRIG (Projected Recoilless Improvised Grenade) which unusually used packs of digestive biscuits as a counter-shot for recoilless operation. 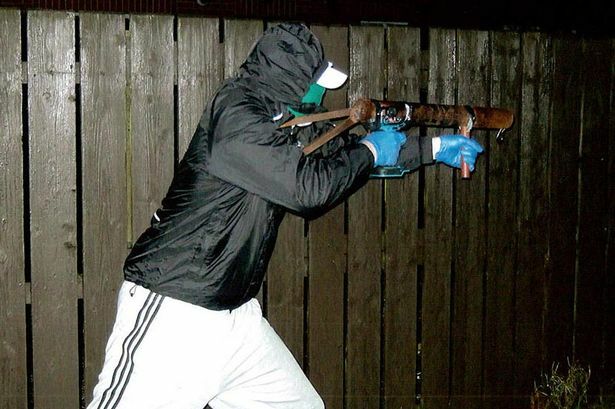 Some earlier improvised launchers developed by IRA factions. The emergence of this new, less sophisticated design suggests a lack of ties with the veteran ‘Engineering Department’ of the Provisional IRA. The projectile, supposedly home-made and reportedly carrying a Semtex (plasticised high explosive) payload did not pierce the primary armour of the PSNI vehicle, although damage to the outer ‘skin’ of the vehicle, consistent with a high explosive detonation, was reported. In contrast, an attack in 1994 on an armoured Royal Ulster Constabulary (RUC) Land Rover using the Mark-16 PRIG resulted in significant damage and the death of a policeman inside. Again, the launcher in this incident was discarded after use, allowing the operator ease of escape. 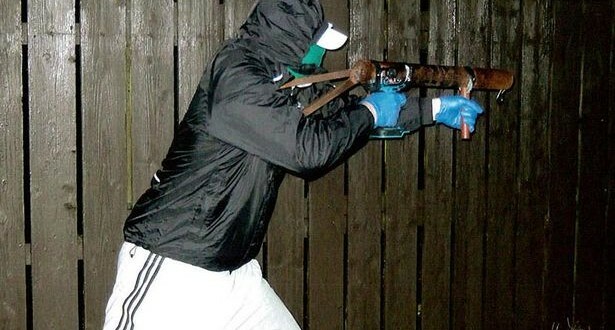 In recent months an increased use of improvised weapons in Northern Ireland has been seen, including the discovery of a ‘calibrated pressure plate’ device left for police in Derry, as well as several explosively formed projectiles being employed against PSNI vehicles. The use of ‘drop and go’ launching devices signals a re-emergence of the tactics implemented by the Provisional IRA during the early 1990s, with the new group reportedly stating its intention of developing new and more sophisticated weapons for use in future attacks. Photos from The Firearm Blog and The Irish Mirror.